Launched back in 1983, Thunder Force was a free roaming shooter viewed from an overhead position. Destroying enemies, turrets and bases as well as section by section of the Dyradeizer. The game also included a level editor function. The sequel added side scrolling sections to the gameplay and a new weapon system. Despite coming as a launch game to Sega's new console a year later, the X68000 version was the slightly better looking of the two. 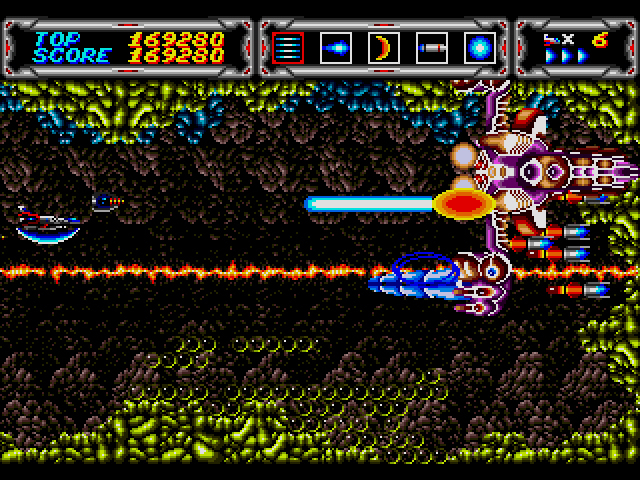 The following year from the Mega Drive versions launch came the third game in the series with the game now completely focusing on the side on horizontal action of the sequences introduced in the previous instalment. Choosing from one of five planets to tackle the game advanced the series plot forward by a hundred years. In just as fast a fashion the fourth game arrived but this time, for many, this one would be the one to break through the glass ceiling of being merely alright to being one of the strongest shooters on the system. The response to the fourth game was strong which has led to it being rereleased up till the current generation. 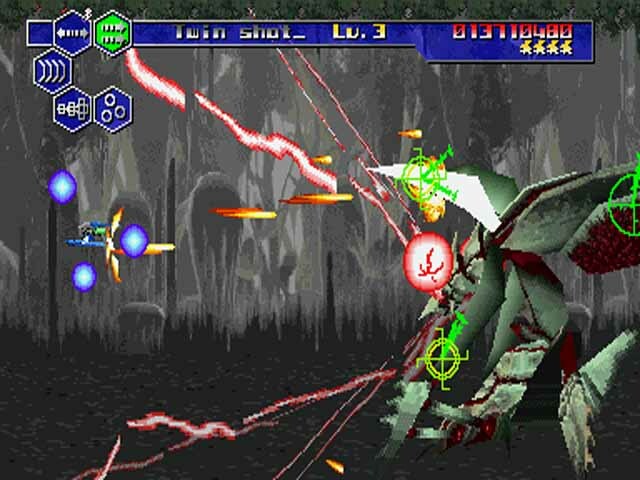 The fifth entry was the first to adopt polygon based visuals for the series and was first seen on Saturn, a PS1 port arriving the following year with the subtitle Perfect System. 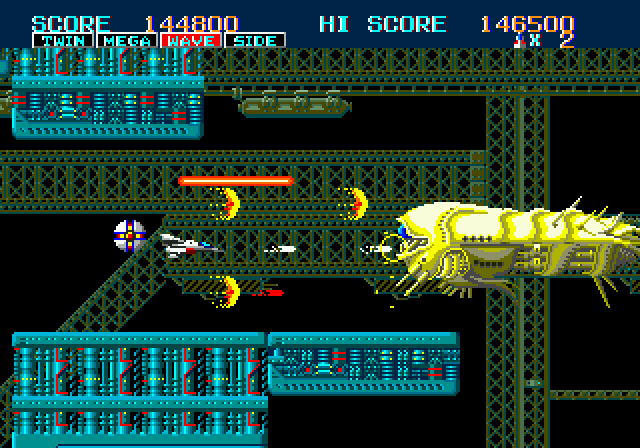 The game is largely similar in structure to the previous game with the key area of note being that the later version isn't so perfect, it's visually inferior to the Saturn original with several effects having been removed in addition to Sega's version featuring better audio though the PS1 version has less slowdown. Once again the series received a solid reception despite how old the genre was starting to appear. Despite the positive response the previous game received, the final entry in the series was released only in Japan. Arriving over ten years after the fifth entry, the game received middling review scores and its limited exposure dampened any chances of seeing a hoped for seventh entry. Thunder Force IV is the greatest horizontal shooter of all time. I’ve never had the pleasure of playing the first game but I like TF2, 3 is a genuine classic and probably somewhat underrated. TFIV is awesome all round. I actually bought a PAL copy from Boots, I didn’t know it was getting a UK release but there it was. And it was 50Hz optimised with the longer frame time giving less slowdown in the rare spots that have any. TFIV is a visual and audio tour de force with tight challenging gameplay to back it up. I played it so much back then that I could 1CC it. No chance of me doing that these days! And who can forget that intro. Heavy guitar riff, meaty explosions all perfectly synchronized with the graphics. Superb. TFV is probably up there with TF3 it’s a solid game with catchy tunes and some impressive visuals. The triangle lock on weapon is a bit overpowered though. TFVI was a bit of a disappointment to be honest. It’s just an ok hori and not much else. It lacks the feel of the earlier games which is a real shame. love Thunderforce IV, managed to get a mint Japanese MD copy just the other week, finished it twice already. great game and soundtrack! TF3 is a golden classic I have great memories of. TF4 is really amazing with how it pushes the hardware so hard. I need to go back to TF6, as I only played it a few times back in the day and can't remember much about it. Cool, I love Indiana Jones! I agree that TFIV is a hardware pusher, it looked like a Neo Geo game to me when I first saw it running. I do prefer TFIII; I find TFIV difficult with the vertical scrolling as I want to see all the game and generally get punished for it. All times are GMT. The time now is 07:08 PM.